Jim Groom kicked off his keynote by saying that he intended not to talk about DS106 but then acknowledged it was his life. His next confession was that he didn’t do any OER and felt alienated from American model of using Open to lower costs of textbooks, meanwhile diverting funding away from public education. Jim riffed on the idea that the money and energy used in implementing and supporting VLE/LMS could be used for different approaches to sharing and practicing openly. 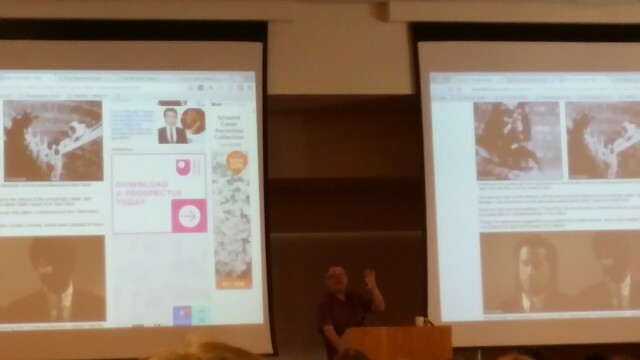 He gave examples of how Wikipedia was used in education in ways that enable students to become producers as well as consumers, supported by their teachers. His next example was femtechnet which worked openly on Wikipedia and across the web, informed by feminist values. Then he got on to his work at University Mary Washington, enabling students to publish in their own space without the hassle of the earlier tilde spaces. And now, he got onto DS106, a phenomenon that sprang from work with students on courses but became a distributed phenomenon where the digital stories were located in personal spaces but linked from the central DS101 web site. His next example was a great example of student-generated content, a crowdsourced assignment site where assignments were shared in ‘drive by mode’. The DS106 assignment bank was the idea of <get her name – anyone know please put in comments> and took off with support from all including Alan Levine who developed supporting features. Next was DS106 radio, a phenomenon that sprang from the need to have synchronous conferencing at DS106 and evolved into the web radio site that flourishes still. Another firm favourite sprang from an idea called the Daily Shoot where photographers shared images daily. On DS106 this became the Daily Create. DS106 thrived not only via Open Source software but also across Social Networking Services like Twitter. DS1016 also uses live video via Amazon Web Services. 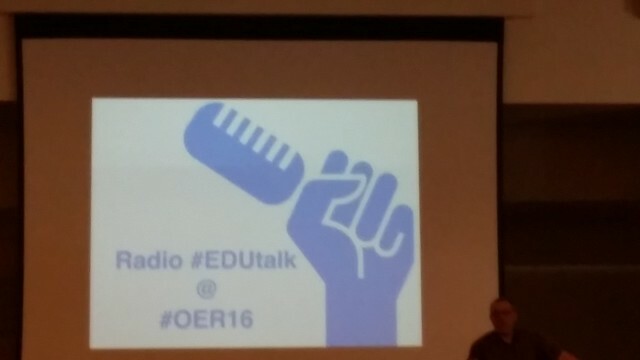 Jim gave a heads up to Radio #edutalk at #OER16. Jim recommended listening to a Jon Udell talk at Educause that predicted that digital infrastructures would change become a network of personal repositories each of which contained all of the stuff that related to an individual. This inspired Domain of One’s Own at University Mary Washington. Now Jim moved to Project Reclaim and Personal APIs. The personal project is to log all of the places that you are on the web and aggregate links back to your own personal space. He described use of a single tool to do this without worrying too much about which tool or how. Next he spoke about Opensource Apps for educators and Tony Hirst’s work on Containers in the cloud. And then, a dramatic and abrupt conclusion of personal spaces linked across the web that, for me, brings us back to we all started. Posted on April 20, 2016 April 21, 2016 Categories bellblogTags cloud, container, docker, domain of ones own, jim groom, webLeave a comment on #OER16 Can we imagine tech Infrastructure as an Open Educational Resource? Or, Clouds, Containers, and APIs, Oh My!